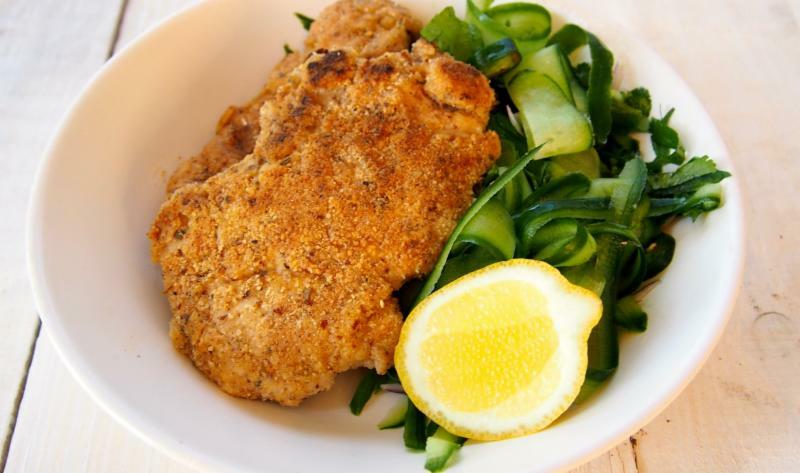 Brooker's Favorite Gluten Free Chicken Schnitzel Recipe! 1. Place a piece of cling wrap on the bench/counter and lay your Brooker's Chicken Schnitzel pieces out on top. 2. In a bowl combine the almond meal, tapioca flour, paprika, oregano and salt and pepper. 3. In another bowl whisk the eggs. 4. Coat the chicken in the almond meal mixture and then dip into the eggs. Shake off excess and dip back in to the almond meal mix. 5. Continue to do this for all chicken pieces. 6. In a large fry pan heat a little cooking oil to medium heat. 7. Place the chicken thighs into the fry pan and cook for 6 minutes, flip and cook for another 6 minutes or until cooked through. Continue this process with all chicken pieces.